From Texas - May 25, 2016 "America's Future: What Should Our Budget Priorities Be?" Verna Dewees shared this two-page report about a delibertive forum held May 25, 2016 at the Southwood Community Center in College Station, Texas. 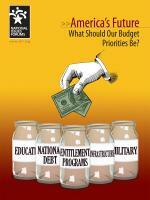 At the forum, participants focused on the public issue presented in the National Issues Forums (NIF) issue guide titled, America's Future: What Should Our Budget Priorities Be?